Our design phase benefits from in depth knowledge of construction and our experience with the build phase. "How can you design something efficiently without knowing how to build it?" 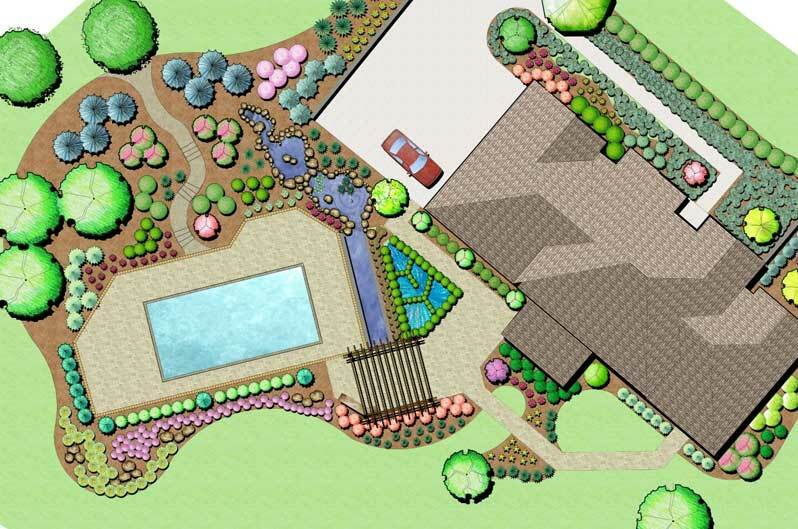 George Brown, Registered Landscape Architect and Owner of Brown Design Group, leads our team of graduate Landscape Architects, and offers you a prestigious level of landscape design. Beyond earned credentials, learned skills, and obtained design knowledge, field experience in construction is one of the greatest assets we can apply to design. Good design accomplishes function; great design accomplishes engagement, it provokes feelings, encourages thought, and stimulates conversation. Great design is good art! Realizing this, Brown Design Group’s goal is to create your new space by realizing your lifestyle and its intricacies. The beginning of your new space is not our design process, the initial conceptual drawings or even the first shovel in the ground. Brown Design Group believes in finding the true meaning and feeling of your project, and holding onto that vision through the entire design, build and care process. How will you use the new outdoor space? Relaxing with a good book, catching up with old friends, celebrating with family, rekindling a relationship, inspiration for your thoughts, or just having an outdoor family dinner. Brown Design Group wishes to engage you in conversation and in thought. We want to listen to the details of what you enjoy, how you relax, what you celebrate, and what excites you. Then we define the guidelines of the program based on your desires and what is important to you. Brown Design Group creates the ideology of what your space will do, when entertaining guests, celebrating events, spending time with a loved ones, or just unwinding from a busy day. We then select the form, style, colors, scents, sounds, and textures that will carry out this ideology. We help guide your decisions based on our design skills as well as our field knowledge. We will support your decisions and strengthen them with experienced and positive suggestions. Upon the selection of the final design we will continue the seamless flow of the design to the build. Knowing design doesn’t end at the completion of the plans, we work with you through the build to ensure all your expectations and desires are met and any necessary adjustments are made along the way. As the build is accomplished, our loyalty to you and your project resides in the proper care of the new space. Given the appropriate care, the original integrity and flow of the project is maintained for years to come. All design processes will vary in their timing and system due to the size, the scale and the detail level of the project. Some design projects may be completed in our first meeting while others will take several revisions to finalize the design. Prior to our initial meeting, we will provide you with a "Needs Assessment Questionnaire" and ask you to provide us with some basic site information. Providing these important details allows us to begin thinking about the project before we even step foot on the site. As a result, we are able to spend more time during our first meeting getting to know you and your desires for the project. In our initial meeting, we will discuss your vision for the project or space and your needs and desires in greater detail. If you don’t have a vision or a concept for the space we will help you develop one that takes into consideration your needs: including budget, time constraints, and your likes and dislikes. We then create a series of sketches, normally 2 or 3, to show you quick ideas of the potential for your space. The sketches will include some different styles for the space without getting into great detail. As this set of plans is created, we will also take into consideration your general budget. We then review these designs and associated rough estimates with you in person or through correspondence to receive your feedback. Upon review of the preliminary drawings or sketches we will move forward on developing the design and the refining of one or two of the drawings. Depending on the project we may combine certain aspects of several layouts. We will again review these drawings and budgets until you are comfortable with the design and cost. We continue the revision and review process until you are completely satisfied with the design. Upon acceptance of the final design we will provide a proposal for construction services and review this with you.